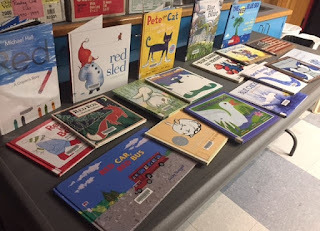 I had a BLAST this morning with my Red, White, and Blue storytime! I wasn't sure if I would have many come - lots of families are on vacation and making this a long weekend - but we ended up with a great crowd and they were so into everything. I wanted to do something a little related to Independence Day, but I don't like to do holiday storytimes, so I went with the theme of Red, White, and Blue. Not only does this tie into the holiday without being overtly holiday themed, but it gives a lot of flexibility in planning so you can choose your favorite stories, felts, and rhymes. I wore a red and blue dress in honor of this storytime and realized that I was twinning our Spider Man mannequin. (Red) Book: The Little Mouse, the Red, Ripe Strawberry, and the Big, Hungry Bear by Audrey and Don Wood (Child's Play, 1984). I love this book because of the humor and because kids really have to take in the illustrations to get the humor in the story (and it's a large book with big pictures that is easy for a group to see). There's a lot that you can talk about with kids in this book. I especially like pointing out the mouse's facial expressions and asking how he's feeling. This is a great way to model for parents how books can help you have a conversation about emotions. One of my preschoolers pointed out at the end that we never saw the bear in the book, so we talked a little bit about how we heard about the bear and we were maybe a little afraid of the bear, but we never actually saw the bear. I use a bear puppet with this rhyme and he "eats" the apples off the tree. Children can play along with me by using their five fingers as the five little apples. Hearing rhymes helps children hear that words are made up of smaller sounds. This rhyme also practices counting down. (White) Book: It Looked Like Spilt Milk by Charles G. Shaw (Harper & Row, 1947). This classic picture book shows lots of different shapes - many different shapes a cloud could be. I found it fascinating that during my reading, lots of kids called out possibilities of what "it" was. Slime! Water! Play Dough! But no one guessed a cloud until the very end. Action Song: "Jump Up, Turn Around" by Jim Gill from his album "Moving Rhymes for Modern Times"
At this point, everyone was a little squirrelly, so we all stood up for an action song. I like to sing in storytime, but sometimes it's nice to use recorded music in order to expose families to new songs and artists. This song is not only fun and silly, but when dancing to it, children are practicing gross motor skills (jump up, turn around) and following directions (a school readiness skill). For this felt, you just place shapes on the board and say their color. "This heart is red. This fire engine is red. This apple is red." And THEN... "This snowflake is red..." The kids will immediately howl with laughter and correct you. Then you continue on the next line, and so forth. The very last piece will go with any line since it is red AND white AND blue! Oh man, the kids LOVED this one. They laughed and laughed when I said the wrong color and they were happy to jump in and correct me. 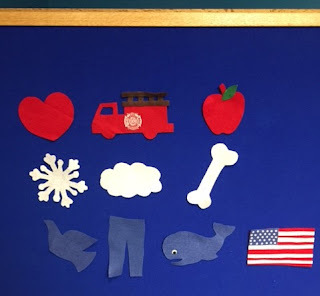 This is the perfect age (3-5 year olds) to do this felt with! It's fun, but it also helps them practice colors and it gives them a sense of empowerment when they know better than the librarian (hey, librarians don't know EVERYTHING). (Blue) Book: One Little Blueberry by Tammi Salzano (Tiger Tales, 2011). 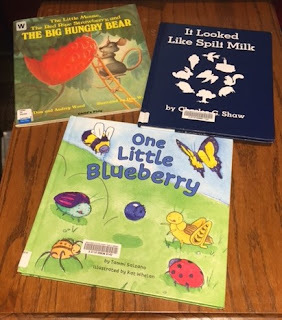 The rhythmic, rhyming text of this picture book describes groups of bugs chasing one little blueberry as it rolls down a hill. It's a cute book to share in summer or spring when you're seeing a lot of bugs (and/or berries) around. Again, rhyming text is great for helping kids hear the smaller sounds in words. And this book counts up from one to ten as more and more bugs join the chase. A surprise ending lends a little whimsy to the tale. Scarf Activity: Fireworks!! Because I had planned a fireworks craft station for afterwards, I wanted to incorporate fireworks into the storytime somehow. Scarves were the perfect fit. I passed them around and we did our usual warm up activities (wave high, low, fast, slow) and we waved them in the shapes of lines and shapes (helping to practice or introduce this knowledge, which helps with letter recognition later on). Then I told them we were going to make our scarves into fireworks. I had them scrunch their scarves into little balls and then we tossed them up in the air and yelled "BOOM!" We did this several times and then I asked them to look and notice what color scarf they had (they will take a minute to shout out the color to you, just wait). And then I called for the fireworks one at a time by color. After that, we all did our fireworks together one last time for a grand finale!! And then I called them to bring me their scarves by the color so we could put them away. This was a really simple, basic activity, but the kids had a lot of fun with it! We made a connection between our activity in storytime and an activity they may be doing with their family later tonight (watching fireworks). We also practiced gross motor movements, following directions, and identifying colors. I don't always do a craft, but when I can think of a simple, fun craft I like to offer it. I searched on Pinterest for non-messy firework crafts (no paint or glitter for me!) 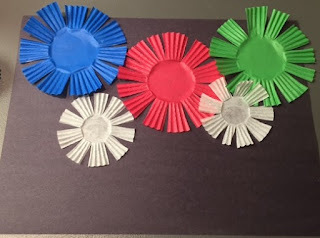 and found this easy craft that uses solid color cupcake liners to make fireworks. All the kids had to do was cut along the ridged part so it would spread into a firework shape and then glue onto black construction paper. Thanks, Pinterest! This is a great craft for practicing scissor skills and I really encouraged the parents to try to let their little ones do the cutting. Here's another connection from storytime to watching fireworks with family (our town's firework show is tonight!). All in all, the kids had a fun time and I had a blast! If you don't like or don't have the books mentioned here, feel free to substitute books of your choice!